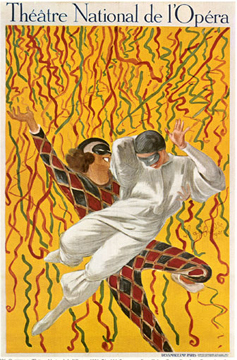 Two revelers, in harlequin and columbine costumes, frolic amid red and green confetti on a yellow background, an invitation to a masked ball at the Paris Opera. This version has the letters "Gd. Bal Masque/ Mi-Carême 1921/ Jeudi 3 Mars" across the top in black not shown here.